Top Rank's CEO Bob Arum strongly feels that Manny Pacquiao should avoid IBF welterweight champion Errol Spence. Pacquiao was ringside last Saturday night, and watched Spence dominate four division champion Mikey Garcia over twelve rounds for a unanimous decision win at AT&T Stadium in Arlington, Texas. After the fight was over, Spence called out Pacquiao for a summer showdown. And the Filipino superstar said he was very interested in taking the fight. Arum had promoted for Pacquiao for over a decade. The Filipino star is now in a partnership with Premier Boxing Champions, who also work with welterweights like Spence, WBC world champion Shawn Porter, Danny Garcia, WBA champion Keith Thurman, and several others. 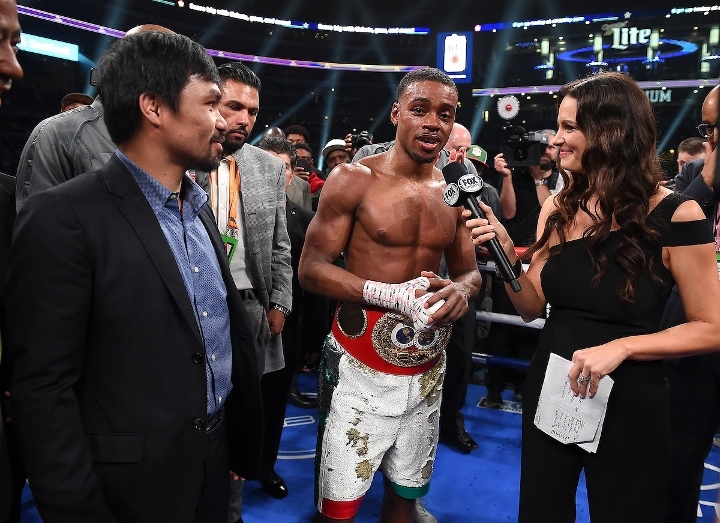 Arum says Pacquiao should face Porter or Garcia - but he doesn't want to see the eight division world champion should instead target a fight with Spence or WBO welterweight champion Terence Crawford, who Arum promotes. "Manny doesn't really want to fight Crawford. And the question is - should he? It's not like he's a spring chicken, he's a guy in his 40s and that means something. A guy in his 40s can run the risk of injury, where a guy in his 30s wouldn't run that risk... cranium is different and everything, so I wouldn't like Manny to fight either Crawford or Spence," Arum told BoxingScene.com. "I think that's a bridge too far. I think if you put him in with a Porter.... Porter is not an elite welterweight and Manny can probably handle him or not get hurt.. that would be an okay fight. Or Danny Garcia who doesn't punch very hard, that would be a good fight for Manny. But Crawford or Spence is a bridge too far, truthfully." Despite the weekend hype, a Pacquiao vs. Spence contest seems unlikely, with many expecting Pacquiao to face someone like Thurman. [QUOTE=JWHardin;19609831]Can you name one fighter that Pac beat that is bigger and better than Spence? [/QUOTE] margarito, cotto all of them are tested and proven fighter while spence haven't face atleast 1 top 5 welterweight. Spence is overrated.